Mercedes has gotten the upper hand in its fight against BMW, but it may not hold onto it much longer. Love em’ or hate em’, crossover SUVs are big money for automakers like BMW, so there’s no way that they are going to be phased out anytime soon. In fact, if there’s any body style that’s under threat, it would be the sedan. Automakers haven’t quite turned their backs on smaller four-door cars just yet, but it’s safe to say they aren’t getting as much love and R & D money as their crossovers counterparts. Automakers see the SUV as the way of the future as well as a sweet way to pad their pockets. It’s why, just a few years after unveiling the original X4 SUV, BMW is already thinking about where its crossover/coupe will evolve from there. And so is rendering artist X-Tomi Design for that matter. Just a few days after the striking new X3 was dropped, X-Tomi has taken a crack at rendering the X4 using styling cues from the new X3 and applying them to the X4 template in order to draw up what the X4’s replacement might look like. Complete with a large confident grille at the front and a sloping roofline, the X4 looks ready to munch up miles in style and more importantly, give the Mercedes GLC some hell. Making things better is the fact that we know the M Division is mingling with SUVs and not just BMW's cars. 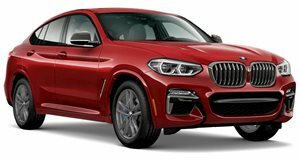 The X3 was given the M40i treatment, so it’s a welcome prediction to expect the X4 to undergo the same transition. Hopefully BMW takes it to the extent that Mercedes-AMG did with the AMG GLC63 S, but that might be asking too much. For now we’ll feast our eyes on this beauty, hoping that BMW doesn’t actually use that tacky plastic and chrome-colored cladding near the bottom of the X4 so that it can more effectively strike back at the gorgeous Mercedes GLC.